Lately, I’ve realized with both horror and relief that I seem to be losing my sweet tooth – the same sweet tooth that drove me, as a kid, to raid fridges and create secret stashes and stretch truths, all with the ultimate goal of getting more cookies. It’s fair to say that I obsessed unhealthily over that goal, and got into hot water over it a few times, too. Sugar was a huge focal point of my childhood and early adulthood, and at times I was a slave to its wiles. My career, for a spell, centered around the pastry station of a busy restaurant, where I assembled desserts and subsisted largely on ice cream, since family meal wasn’t served until the wee hours of the morning. That followed a career that drove me, out of boredom, to eat piles of sweets at my desk during flat, uninspired afternoon stretches as I tried to compose inspired copy about house kits and ugly bath fixtures. The thing is, all those sweets made me feel lousy. I knew it, too, but they tasted so damn good in the short term that I couldn't hold myself back. Now, recently, I’ve noticed I go for days without even thinking about dessert, much less wanting to bake. Since my husband doesn't have much of a sweet tooth, either, we're more than content to chip away steadily at a bar of dark chocolate, if the craving arises (my favorites are the Jacques Torres Wicked Bar and Mast Brothers almond, sea salt, and olive oil). This is not out of virtuousness or an abundance of self-control, it’s just the way our taste buds seem to have re-aligned over the years. I still ogle photogenic treats (here is some of my favorite eye candy). I like the thought of firing up the oven and baking something sweet, and smelling the way the sugar and the butter deepen and meld into something new and handsome together. So it was while hunting through Amanda Hesser's Essential New York Times Cookbook for a savory recipe that I lost my way in the dessert section and stumbled upon this little gem. It's a different sort of cookie, one that won’t make your teeth ache or your hands tremble. 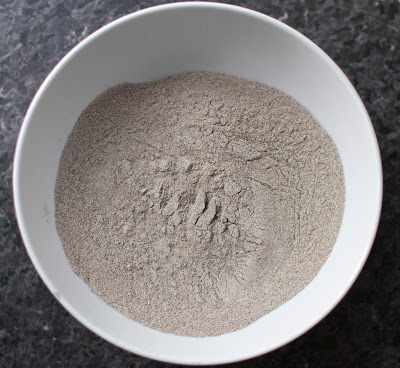 The buckwheat was what grabbed me – ironic, since my love affair with buckwheat began with the Aunt Jemima pancakes my mom used to make, and onto which I unleashed torrents of syrup (not maple syrup, mind you. Just syrup), then swigged straight from the bottle for good measure. Later, I chomped on plain buckwheat groats as an ascetic young vegan, then chowed down on buckwheat crêpes with gruyère in Paris, as a liberated ex-vegan. 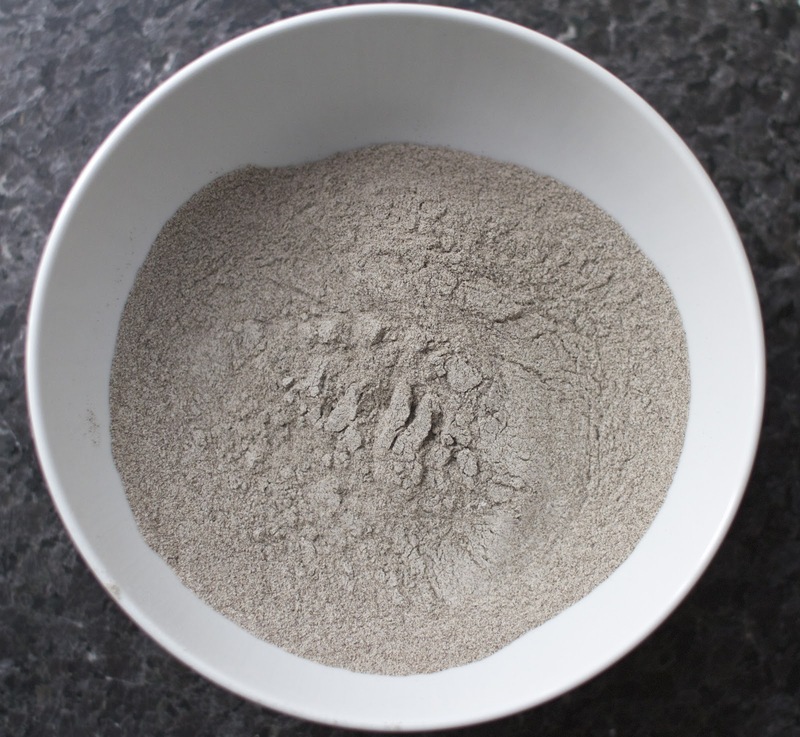 Buckwheat just has that compelling earthy/mineral flavor, any way you dress it (incidentally those plain groats, also known as kasha, weren’t half bad). 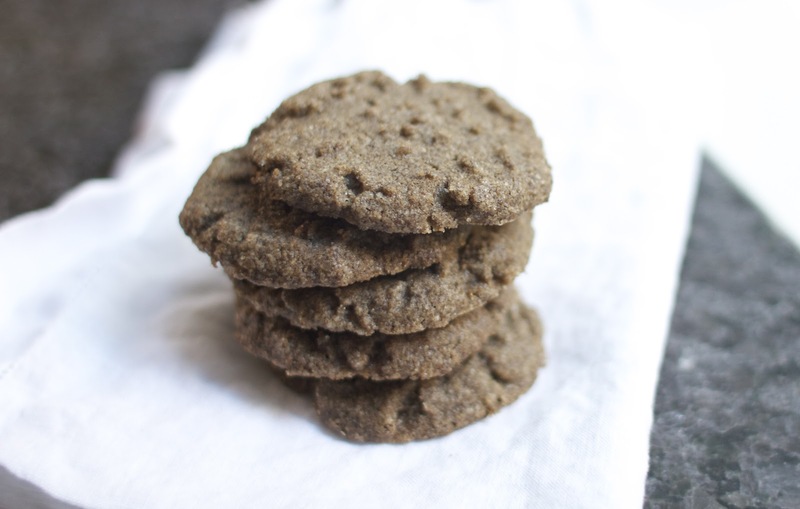 I’d never heard of a buckwheat cookie, though, and immediately knew I had to try one. In fact, the promise of a sweetish buckwheat dessert got me to bake cookies for the very first time since Christmas. I like Hesser’s description of the flavor “like sweet wet stone–in a good way, I promise”. She also points the reader to “a similarly reserved cookie, …the Honey Spice Cookies on p. 685,” as though this were a special category of cookie, one confident enough in its subtle charms that it doesn't have to ooze chocolate or wear gaudy icing. This is the kind of cookie I can share with my kids over tea, after a blustery day on the playground now that the days are getting longer. I’m not about to renounce sugar altogether, as healthy as that would be; I think sweet things have their place in our lives, in moderation, and I do look forward to summer’s fresh fruit desserts. This cookie is plenty sweet, just not jarringly so, and with a slight graininess that gives it wintry substance. It’s kind of like a sablé with a little something extra, and best enjoyed with milky earl grey tea. Note: If you enjoy the nuances different grains can bring to baked goods, I recommend you check out Kim Boyce's Good to the Grain. Next, in your palms roll dough into balls of at least 1 tablespoon worth of dough apiece. You may have to press dough together. 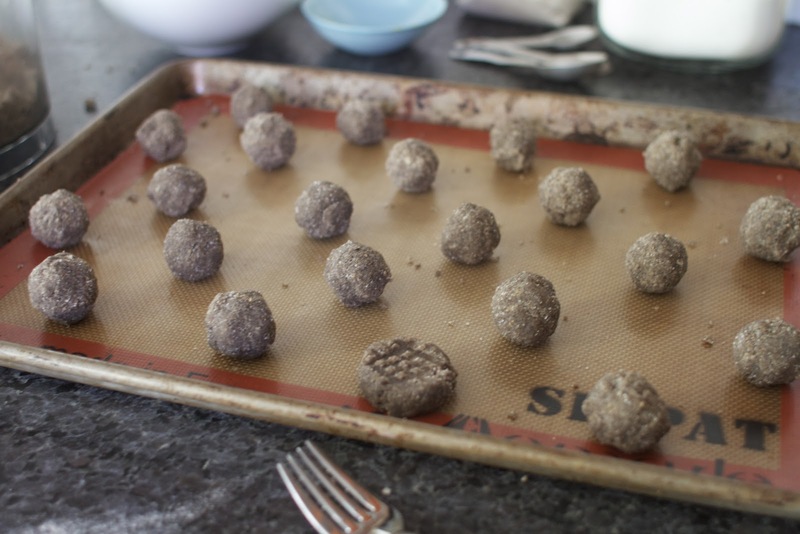 Arrange balls on silpat- or parchment-lined trays with at least 1 inch of space in between. Using a fork, carefully press down on cookies until they are just about a half-inch thin. Bake for 15-20 minutes, maybe more, until beginning to turn golden around the edges – check and rotate trays after about 15 minutes. Allow cookies to cool for a bit before carefully removing to plate or cooling rack – cookies will still be delicate and crumbly when hot. If you had told me, when I landed tentatively in New York, that I would still be hanging around 14 years later, I probably would have laughed at you. I would have been positively howling had you told me that this Virginia transplant would eventually consider herself a Brooklynite – and a proud one, at that. But here I am, and as much as I itch to flee the city on weekends, I adore this little part of Brooklyn where we landed, almost accidentally, seven years ago and are raising our daughters; this post is a shameless love letter of sorts to the neighborhood. I love the sound of the foghorns rolling off the harbor at night and the hulking container cranes at the end of our street, backlit by sunset. Nothing beats the smoky tang of the neighbors' grills firing up on the first warm day of spring, or that crazy, confused tree on Baltic that offers a profusion of pink blossoms in the dead of January – even a real January. There’s the occasional clang of the knife-sharpening truck and the synchronized flock of domestic pigeons you’ll see wheeling overhead as you walk up Henry at a certain time of day, if you look up at exactly the right time. In a stretch that's sandwiched between some amazing restaurants and markets you'll pass Jesus in a box, the filming of Talk Stoop, and a riotously bedazzled row house. There's always a little surprise. Last week, a loud, late-night manhole explosion brought all the characters out of their brownstones, in various states of pajamaed splendor (one woman told me four times that her sleeping pills were kicking in, then followed me like a zombie down the street). I love the fact that I have to add on 10 extra minutes to get anywhere, because I know I'll bump into a friend or neighbor I haven't caught up with in a while…but somehow, I'm always late anyway. More and more familiar faces have landed here, and lately, the ranks seem to include Toad out of The Wind in the Willows – at least according to my 7-year-old, who upon surveying the wreckage from a couple of recent car crackups said: “I think Toad must have been out stealing cars again.” Of course she knows the truth, but we like to keep a tall tale going; it adds glamour to our already colorful corner of the world. In addition to all that is Brooklyn, there are the riches brought into the borough by farmers from the surrounding areas. Ironically, during the winter we have greater access to regional produce here in the city than we do when we're in the country, where it grows. And almost from the beginning, our weekly farm share (CSA) became an integral part of our way of cooking. Signing up for a CSA, at first, can be like being told to sit in a room with strangers and chat amongst yourselves; some of them, you discover you hit it off with and want to get to know better. Others, not so much. 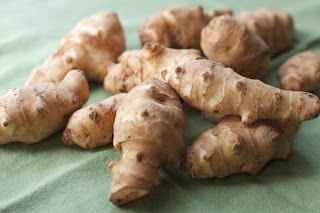 Jerusalem artichokes (aka sunchokes) for me were the first kind of stranger, meaning I might not otherwise have sought them out and had probably stared right through them at the farmer’s market. They’re kind of like the mousy introvert in the room, the one you didn’t notice at first but who later floors you with a warm, nutty personality that just needed a little drawing out. Now, since we get Jerusalem artichokes at least twice a season in our weekly share, they're regulars around here, and I find myself seeking out more when I run low or when there's no CSA – I've been picking them up lately at the green markets and at Perelandra. Often I'll cut them crossways into coins and sauté them slowly in butter, flipping so that each side gets nicely caramelized. The trick to this – and it's hardly a trick – is to not have the heat up too high, nor to crowd them in a pan. Sprinkle a little sea salt over them and serve them instead of potatoes with roast chicken. 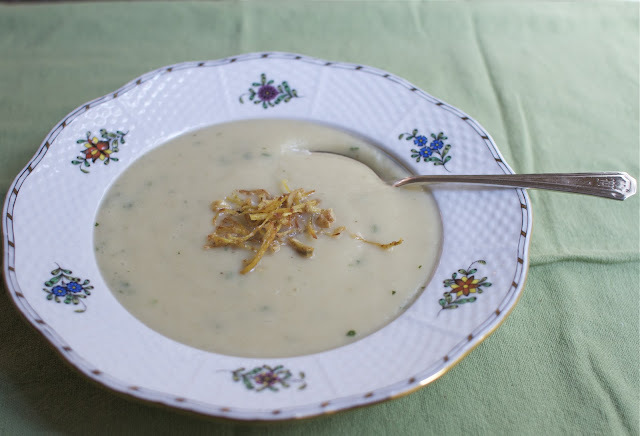 I also used to make a very creamy Jerusalem artichoke soup, using a Daniel Boulud recipe, but this Christmas the husband gave me Nigel Slater's Tender: A Cook and His Vegetable Patch, with its lovely arrangement of fava beans on white linen across the front. He had a hunch this vegetable-centric book would be right up my alley, and he was right. The recipe below, from the book, highlights the particular sweet nuttiness of Jerusalem artichokes. The soup is light and pure on its own and can even go vegan with a quick swap of oil for butter. Whatever you do, though, do yourself a favor and don't skip the spice mix, even though you may be tempted to save time. 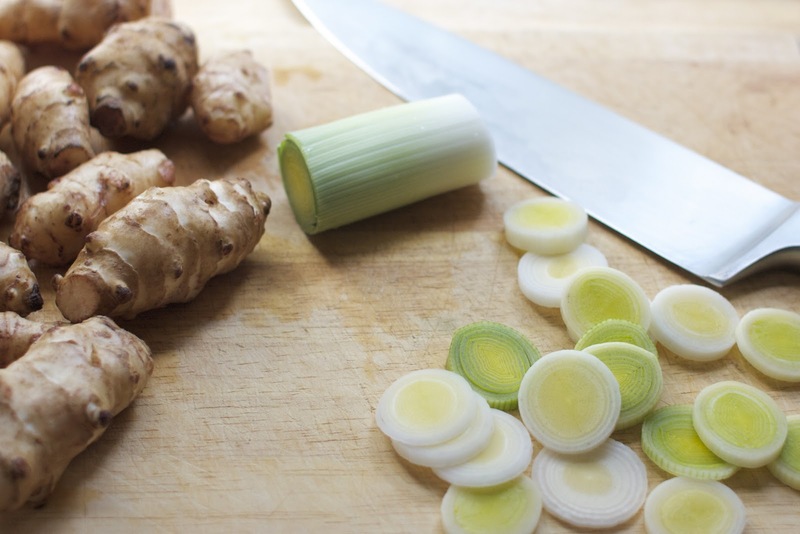 Yes, there's more chopping involved and yes, you'll have to clean an additional pan afterwards – but this crunchy garnish is what makes the soup something special, flavor-wise and texture-wise. Slice the white and palest green part of the leeks into rounds, then rinse away any grit. In a heavy-bottomed saucepan, melt the butter and add the leek slices. 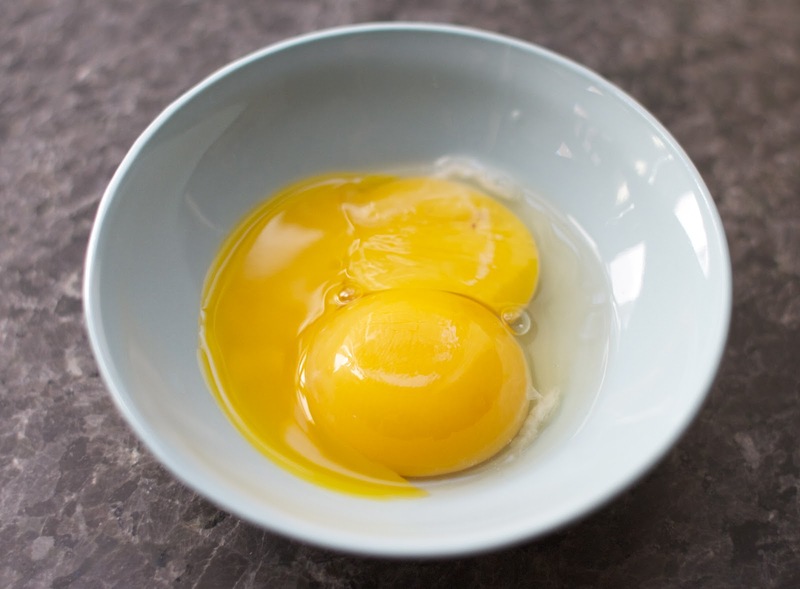 Sweat over low heat until they are soft enough to crush with the edge of a wooden spoon. Meanwhile, slice celery and add to the pot when leeks have begun to soften. Peel and chop the artichokes (I don’t peel too scrupulously – just the really thick, crusty skin) and add them to the pot. Cover the pot and let the vegetables soften without coloring, then pour in stock and/or water, and bring to a boil. Lower heat to a simmer and partially cover with a lid. Cook for about 25 minutes, until artichokes are very tender. Meanwhile, peel the ginger and slice very thinly, then slice into very thin matchsticks. Warm oil in a small skillet and add ginger. Fry for a few seconds, until it is golden and crisp, then add coriander and chopped walnuts to the pan, let them sizzle briefly, then drain on paper towels. Puree soup thoroughly in a blender (or with immersion blender), stir in chopped parsley, then adjust seasoning – you will need to add salt until the flavor tastes full, and crank in a bit of black pepper if you like. Serve topped with spice mix.